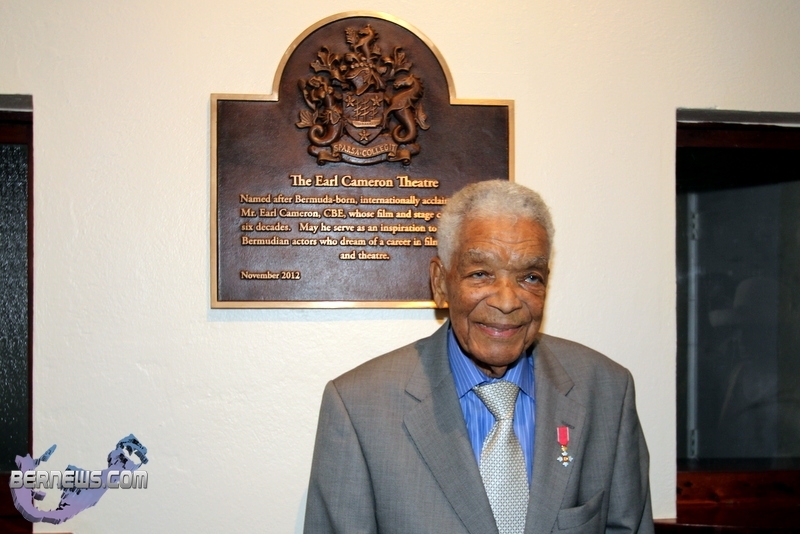 [Updated with video] The City of Hamilton hosted a renaming ceremony today [Nov 5], formally changing the name of the City Hall Theatre to the Earl Cameron Theatre in honour of the veteran Bermudian actor. Mr. Cameron arrived on the island this past weekend with his wife Barbara to participate in the ceremony. The Town Crier welcomed everyone in attendance, which included Premier Paula Cox, Governor George Fergusson and other distinguished guests. Hamilton Mayor Graeme Outerbridge then said a few words, before Ira Phillips took the stage and described some of the highlights of Mr Cameron’s career. 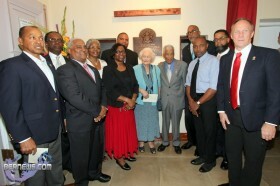 The 95-year-old actor made a few remarks before the plaque was unveiled in the foyer. Mr Cameron’s career spans a half-century and includes dozens of stage, TV and film credits. Born in Bermuda in 1917, he moved to Britain prior to WWII and after a career on London’s West End stage made his film debut in 1950 — becoming one of the first black actors to star in a British movie. By the mid-1950s Mr. Cameron was an established star in the UK and he worked steadily in movies, the theatre and in television. He appeared in dozens of films and TV shows and starred with Sean Connery in the 1965 ‘Thunderball’ playing Pinder, and portrayed African dictator Edmond Zuwanie in the 2005 movie ‘The Interpreter‘ alongside Nicole Kidman and Sean Penn. In 2009 Mr Cameron was named as a Commander of the British Empire for services to the dramatic arts. No doubt Mr Cameron is a nice deserving gentleman but JIMHO if someone’s name is going to be stuck outside of City Hall Theater someone who made a large contribution in effort locally would be more appropriate. Amazing. “a nice deserving gentleman”? How patronising. This man is a giant of screen and stage and because he was forced out of his own country to become so, he doesn’t deserve this? But you have company on your planet, the same sick logic reared its head in the Bahamas where a small but vocal minority opposed naming a bridge after Sir Sidney Poitier. Go figure. “forced out of his country”? My goodness. Was he stopped from participating in the vibrant film industry here then? Would he have become a giant of the film industry here? Or is it possible you’re just talking rubbish? Get over what? I’m not against the name change, just the inane comment from Hmmm. Earl Cameron has had a fascinating life and achieved great success in his field of acting – just listen to him on stage on the video – a remarkable man; he is a most fitting person to name the City Hall Theater after. But he would not have achieved this success here in Bermuda, we just aren’t a big center to provide someone in his field with enough exposure to succeed. The fact that he went out into the world to achieve success in a fiercely competitive field is remarkable inspiration to all who see his name on the theater. Say what? He was in the merchant marine and was stranded in the UK – and found his way into acting there. If you’re an artist in Bermuda you almost have to leave the island by default. Bda is almost 3 miles wide. Looking around elsewhere it appears that I am far from being alone with my opinion &for the same reason. Give it a break men..
God knows what more Earl Cameron has to do to earn the recognition and respect in his own country which he has been accorded internationally for the last 50-plus years. Mr. Cameron followed Shakespeare’s advice — he recognised all the world is indeed a stage and from the 1940s through the modern age has acted in venues ranging from the UK to to Africa to India. 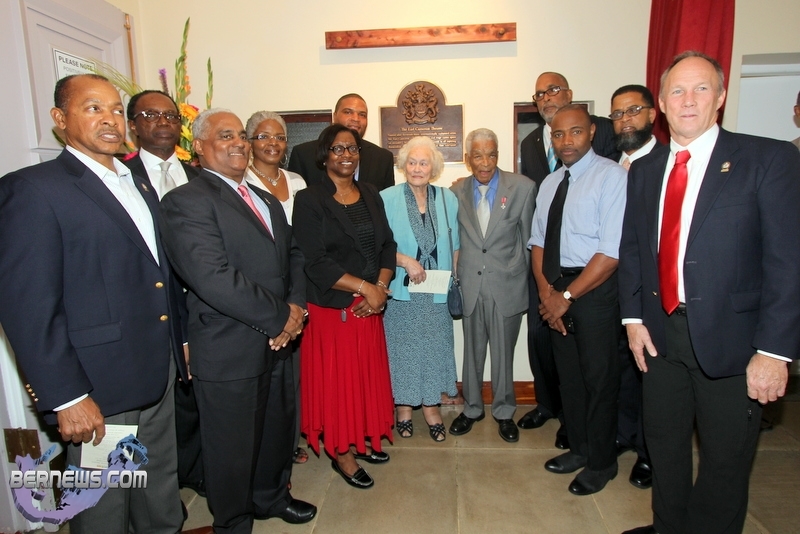 But throughout his storied career, he never forgot his Bermuda roots — altho’ the Corporation of Hamilton appears to have neglected this fact during the dedication ceremonies involved in the re-naming of the City Hall Theatre. It should be noted Mr. Cameron appeared in the title role in an internationally renowned production of Brecht’s “Galileo” staged at City Hall and directed by future Oscar nominee Mike Leigh in 1970. Mr. Cameron went out of his way to tell the “Bermuda Recorder” in a contemporary interview that he was “so happy (to) work here in his native home (and) he was especially pleased to be working with such wonderfully talented artists which he had found here in Bermuda … As an actor he felt a great deal of confidence in the cast and crew of the upcoming production of ‘Galileo’ he was convinced that it would be a first-class production …” As those who saw the show can attest, “Galileo” wasn’t just first-class: it was a triumph. By any yardstick. The production not only enhanced Mr. Cameron’s already sterling world-wide reputation, it helped to launch Mr. Leigh’s career as one of the world’s foremost theatrical and cinematic trail-blazers. Based on some of the comments posted here today, clearly Mr. Cameron is a poet who has remained a stranger among his own people. THANKS TIM,for those kind words, being his daughter, felt i had to say that, and to all the positive feedback you guys have left, bar mr triangle drifter’ of course, reckon you should make like a raft and drift away, your comment about dad was patronising to say the least, as everyone was rightly saying ,dad has never forgotten his roots and never will, and not just cos he is my dad,. 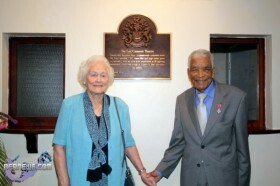 What a wonderful & accomplished gentleman Earl Cameron is, & so well-deserving of this special honour. Bravo!! & to Philipa I would say: don’t let the jealous trolls making meaningless comments here bother you: it doesn’t change the fact that he deserves this & more. Ron & I have such wonderful memories of Earl and Audrey and the kids in the 60s in London. So often we saw them all at the Baha’i Center at 27 Rutland Gate. We still see your movies on TV in US & Canada. Ron & I send you and Barbara our love and best wishes.